The Proposal | katie & luke are getting married! Right after lunchtime, on Friday, 12/21/13, Katie and Luke were both very excited, for very different reasons. For Katie, it was the last day of work until 2013. They were about to go visit the Moss and Ryan families for the holidays, and all her Christmas presents had come in from Amazon. Sure, there were a few last minute items to purchase, but the joy of the holiday season had captivated her; she had seen Elf approximately 30 times so far that month; she was about to go to home to a new apartment and hang out with her cats and her love, Lukie, for 10 days. Life was great. For Luke, 12/21 was the day that he called Katie’s dad and asked for his blessing to propose to her– saying “I want to propose to Katie at Christmastime, but I might not be able to wait.” Naturally, Dave Ryan was very happy about the whole thing and welcomed Luke to the family. Then, Luke went home and got to work. 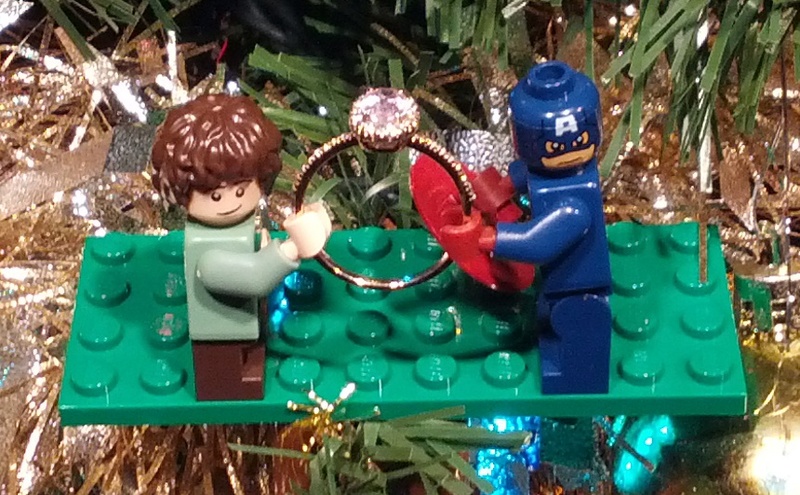 He came up with the perfect way to present the ring to his sweetheart: crafting a Lego ornament featuring Captain America and Frodo, each mini-figure holding onto a gorgeous pink sapphire ring. He placed it delicately on their Christmas tree and went to pick Katie up from the train. But when Katie got in the car, the last thing she wanted to do was go home. “Why go home when we could do a little more Christmas shopping?” she thought. So they drove to a nearby mall, did some shopping, had dinner, walked around, got coffee… all while the ring sat on the tree. Luke suggested that they call it a night, but no! Target was still open– so at Katie’s insistence, they went to Target, too. “This has been the best night ever!” she exclaimed in the car. Finally, on the way home (nearly 7 hours after Luke met Katie at the train station), the couple teased one another about giving presents early. Katie had no idea that the best present she’d ever get was ON the tree, not under it. They walked into the apartment, and Katie walked right over to the tree to put all her bags down. 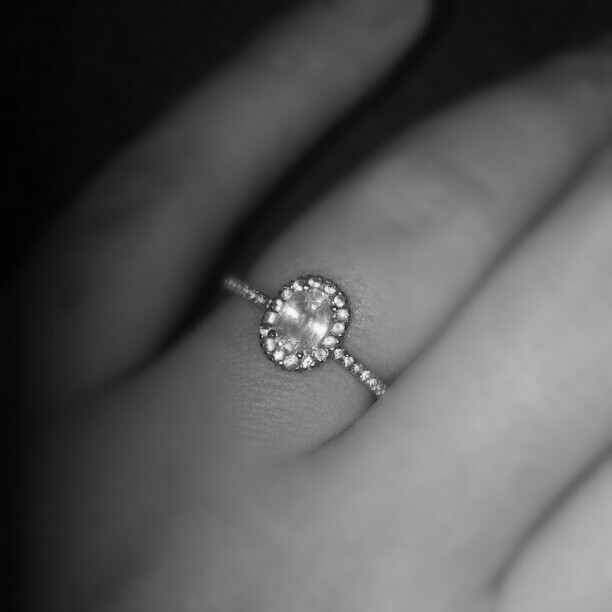 Katie saw the ring and was totally caught off guard. She picked it up and turned around, and Luke was there before her, kneeling. He asked, and she said yes, and then she laughed and cried with joy for hours thereafter.